Calm your newborn with this pillow! Parent has sleepless nights when their baby fusses and non-stop crying. Babies are very sensitive to sudden movement , dazzling bright and noise. 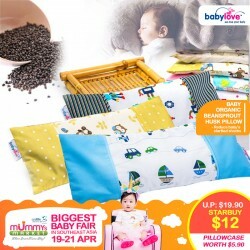 The tradition of home -made “pacifying pillow” with bean or rice had proven it can effectively aid babies to sleep better. 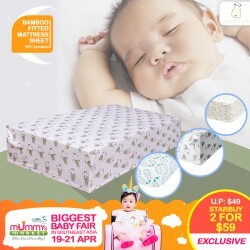 Babylove continues the wise cultural inheritance with our innovated Baby Organic Pillow. BabyOrganic Pillow is 100% natural and eco Friendly. 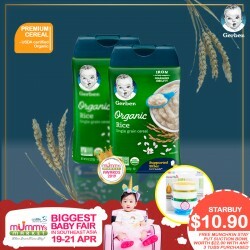 It is filled with anti-bacterial treated bean sprout husks, which are light-weight and porous. Get this all in 1 system, no need to purchase seperately!! As your child grows the Pivot’s usefulness evolves to accommodate both forward – and rear-facing seated positioning. - Designed and tested for structural integrity at energy levels approximately 2x the federal crash test standard and tested to simulate a side impact event and rollover event. The SafeMax™ Infant Car Seat also features an Anti-Rebound Bar that limits the amount of rebound movement experienced in the event of a frontal-impact. 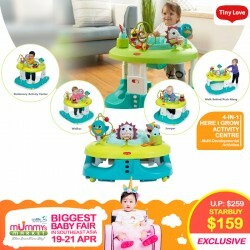 Looking for toys to keep your little one entertained? 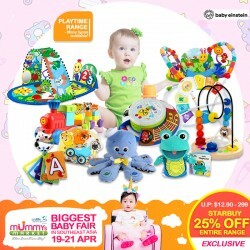 Discover playtime with BABY EINSTEIN TOYS!! CHECK IT ALL OUT NOW AT BOOTH H09!! 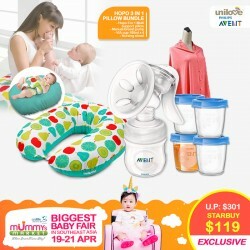 Pump with soft massage cushion!! Travel cover and sealing disc!! Thanks to the unique design of this breast pump, you don't need to lean forward to express. Your milk will flow straight into the bottle, even when you are sitting up straight. This means you can sit more comfortably and feel more relaxed, which is proven to help your milk flow. Our breast pumps were designed with your comfort in mind. The soft and velvety texture of the massage cushions feel warm and comfortable against your skin, which can help stimulate milk flow. And cushion, with its massaging petals, is designed to mimic your baby's suckling action, which can help milk letdown. The lightweight and compact design means you can easily express at home, or take it with you for expressing on-the-go. Easy to use -- and clean! This breast pump has been deigned with only a few parts, which are intuative to assemble, and easy to clean. Just another way we can make like a little easier. 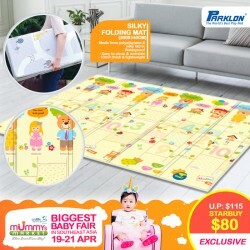 This SILKY Folding Mat is made from PE (polyethylene) Silky fabric. It is lightweight, waterproof and portable. 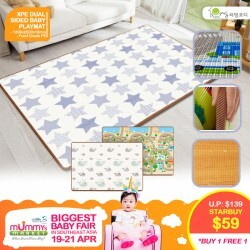 Ideal for both indoor and outdoor use - recommended for those who already have a Bumper Playmat™ for traveling or limited use. 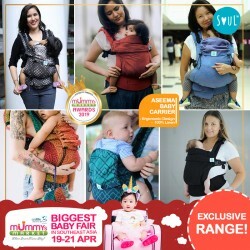 Inspire and amuse your baby with this!! Guaranteed to keep them occupied for hours and provide endless fun!! Gets Reading in 1 Sec!! 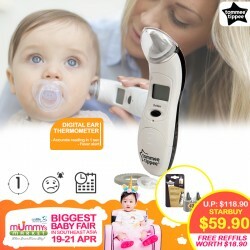 Tommee Tippee Closer to Nature Digital Ear Thermometer. Tiny tip is ideal for newborns as well as the rest of the family.One second accurate reading and large LCD makes it easy to take babys temperature.Fever alert alarm for when temperature is too high.Stores 9 memory readings so you can monitor babys temperature with ease. 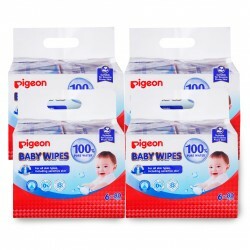 Introducing NEW PIGEON Baby Wipes with maximum softness for ultimate comfort and care during wiping. Using the right combination of fabric and an intricate technique in weaving the fibres, PIGEON is able to offer an extra soft wipe for baby smooth skin. The fabric of these wipes are made so soft, they soothe baby’s skin yet at the same time weaved to perfection to take on the rigors of cleaning without tearing. This lightweight sleeper from Ingenuity makes for peaceful sleep, even on-the-go. 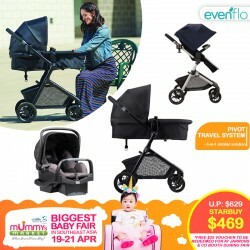 Take baby’s favorite place to sleep on the go with this highly portable, rocking bassinet. The FoldAway Rocking Bassinet™ a cinch to set up: it pops into place in seconds, and folds back up with one step for transport or storage. Its rocking feet can be used to gently soothe baby, or converted to stationary mode for night time sleep. 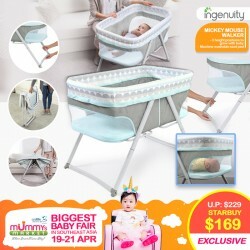 At either end of the bassinet are breathable mesh panels, which help improve air flow, keep baby comfortable, and keep baby in sight so both mom and baby can rest easier. The contemporary and fresh colors of the Juniper fashion is sure to compliment the décor of most homes and is perfect for baby girl or boy.